My friend Ralph, from Campaign to Protect Rural England, and I went for a bike ride and happend upon a demonstration. 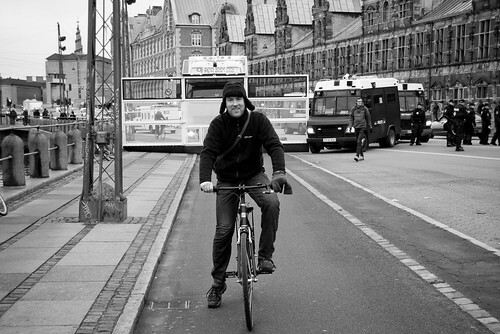 If you look past all the climate conference hype in this city and look at the everyday life, it's really bizarre to be a Copenhagener. All the main hotels are surrounded by concrete barriers, the police prescence is absolutely massive and traffic is disrupted in a seemingly random manner in the course of day. It's not random, of course, but it seems like it. Worth mentioning that whenever streets are cordoned off, bicycles are, as a rule, allowed to pass. 1-0 for human powered machines. And when entire streets are blocked because a demonstration is on the way, you get to ride out in the middle of the street and experience a reclaim the streets feeling. 2-0. For me, personally, it's the police prescence that feels rather disturbing. This calm, cool Nordic capital has been transformed into something so far removed from reality. The Danish police don't have enough vans and trucks for this job so we're seeing yellow and blue Swedish police vans and green German vans all over the city. In the case of the latter, 'polizei' is stickered over with 'politi'. It's unnerving in some strange way to see police equipment in the wrong colours. I get a strange sense of occupation. Last Tuesday was most bizarre for me. I was heading into the city to give some interviews - three a day for the past 10 days - when I saw policemen and vans on a main street leading to the centre. It was a kind of checkpoint. Then I saw, over at Queen Louise's Bridge the same checkpoint system and the police were pulling over vans and even cyclists to conduct searches. Along The Lakes was a sight that I haven't been able to shake off. A checkpoint administered by police carrying machine guns. THAT is so completely un-Danish. I wasn't in Copenhagen, I was in some faraway place. I later learned from a friend - a former policeman - that a major terrorist threat had been picked up. Not activists with bicycles and balaclavas but the hard-core religious fundamentalists. No, not the christian ones, the islamic variety. Which explains the checkpoints, but it still leaves me rather shaken. I'll be sad to see the world leave our city, but I won't mind seeing the back of the police prescence. During the massive climate conference demonstration last Saturday, a whole bunch of people were arrested at the tail-end. The way they were treated was appalling and shocking. I did, however, like the headline on one newspaper the next day: "Climate Party - 99,100 people didn't get arrested!" The police state attitude of the police is something that I'm not proud off. It's madness drawing truncheons and pepper spray on unarmed protesters, as the world - fortunately - saw yesterday. Which brings us to this video. I blogged previously about how the police confiscated what they called 'war bikes' from The Candy Factory where The Bike Bloc was building them. This video was filmed inside the building when the police arrived. Have a look at see what doesn't make me a bit proud. 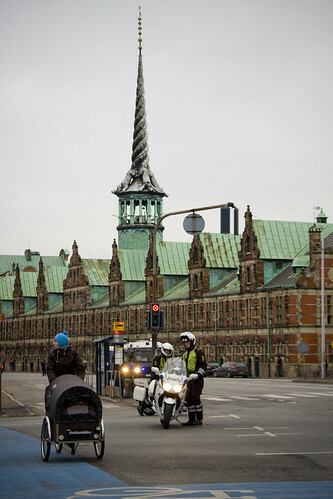 The Danish police exercising their new powers under the so-called Lømmelpakken, which are the laws pushed through parliament for this climate conference.